Home / Interior Design / Bathrooms / The wait is over! We bought a house! Last month I shared that I had a secret I was itching to share, but that you’d have to wait to find out what it was. Now I can tell you!! 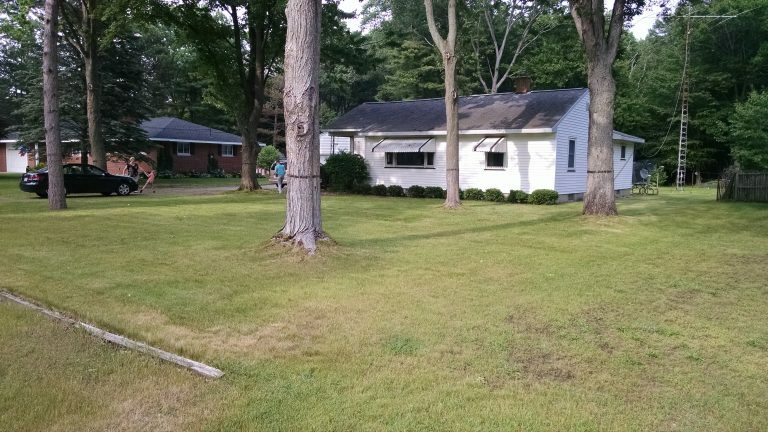 Drum roll, please… We bought a new house!! We closed yesterday, and have already made some huge progress. Mostly removing wallpaper. There’s nothing like removing wallpaper to make you feel like the house like yours instead of someone else’s. I told Jim that, and he disagreed, saying there was nothing like signing a mortgage to make is feel like yours! He just doesn’t get it. haha! Okay, let me show you around. Don’t mind the mess. We’re just getting started. 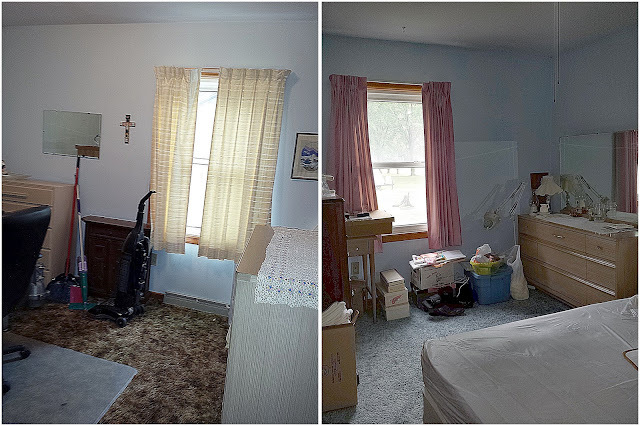 Actually, these pictures are from before we got possession, so all the stuff in the pictures belongs to the old owners. The kitchen needs to be gutted, but it is the perfect size for us, and we like the breakfast nook area. Let’s start out in the kitchen. It’s a nice size, and it has a breakfast nook area that we like. We’re going to gut the kitchen because the layout is not ideal. Originally, we thought the cabinets would work if we painted them, but now we know they won’t. I can’t wait to get started, because we’re having custom cabinets made by an Amish cabinet maker. It’s going to be fantastic! We’ll be taking down the wall behind the sofa to open it up to the dining room. The living room is a little larger than the living room in our current house. We’re planning on removing the wall behind the sofa so it flows into the dining room. I’ll show you the dining room in a minute. You’ll see why the wall needs to come down then. Can I just say our realtor did a fantastic job of finding us a house that was not cookie cutter? And let me tell you, we didn’t make it easy on her, because we both had a long list of wants. But she did a great job. I’ve never seen a house laid out this way before. Once the wall is down, it will really make more sense, but it’s kind of a maze right now. This is the wall in the dining room that will be taken down to open into the living room. Okay, onto the dining room. We think this room was originally a bedroom before the addition was added on the back of the house. It is in the center of the house and has no windows, so very little natural light gets to the room. See how dark it is? That’s why we want to take out that wall. 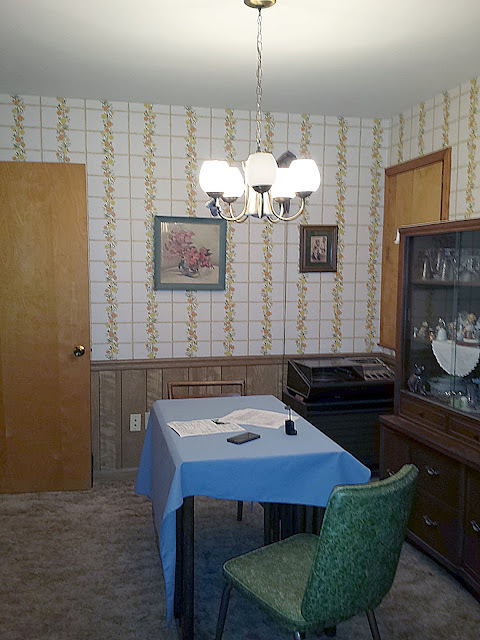 Of course, the 1970’s wallpaper and paneling wainscot need to go also. The chandelier is cool but does not go with my design plan, so that will be going too. Jim checking out the family room the first time we looked at the house. 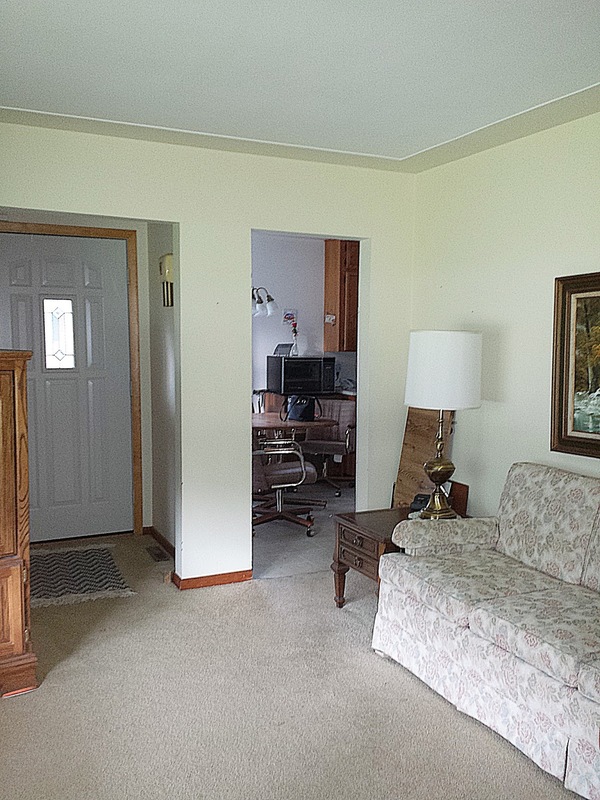 I think the family room is the room that really sold us on this house. We love the idea of having a fireplace, and I love the stone on this one. I’m not, however, in love with the dark paneling, the short plaid curtains, or the carpet. But hey, all that can be changed! This is the largest bedroom with the most closet space. Still small by most standards. This room will be our bedroom. It’s the largest of the three bedrooms, and it has a huge closet. It’s not a walk-in, but it will hold all our clothes. The paneling in this room is the same as in the family room, so it has to go. It’s entirely too dark. The other two bedrooms will become offices for each of us. I’m finally getting an office of my own! Jim’s office will be the one on the left, and mine will be the one on the right. I have no idea what I’m going to do with the bathroom. 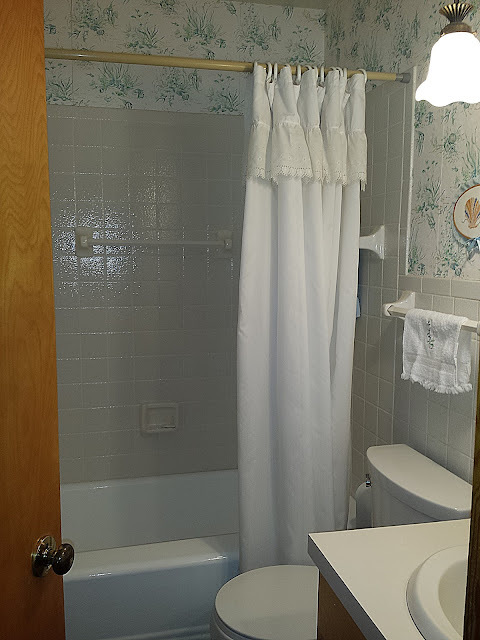 I don’t like the tile, the vanity, and sink or where the towel bars are located. However, even though you can’t see it in this picture, it does have a great built-in cabinet with drawers that I love. That’s going to be nice because I don’t have any real storage space in our current house. I don’t know… The bathroom might have to be gutted at some point also. We’ll see. I don’t love a lot of things about the bathroom, but it does have a nice built-in that I’m going to like. Well, there you have it–a complete tour of our new house just the way it was when we first viewed it. Since we got possession, I’ve already started making some changes. 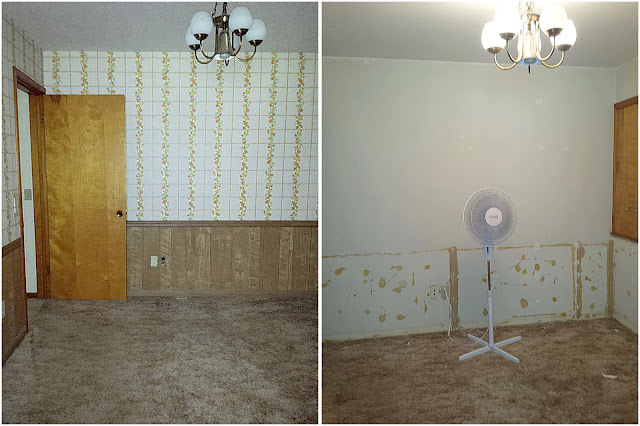 The wallpaper in the bathroom and dining room has been removed, and some of the many doors have been removed. The wallpaper and paneling have been removed and so has that door. Of course, I started designing the house and planning the renovations long before we got possession. It’s actually completely designed on paper. It’s just a matter of getting the work done. Luckily, we have the luxury of being able to stay in our current home while our new one is being renovated. But hopefully, we get everything done quickly and be moving in before you know it!